**ADOPTED** PADDY – cheeky young chap! Paddy is a gorgeous cheeky young boy who is only 12 months old. He is full of fun and loves to play! Paddy needs to learn his basic training, but is very clever and will pick things up quickly. As he is a young boy, he is full of beans and has lots of energy, he gets bored easily and does have a habit of finding things (anything!) to chew when he’s bored! He will definitely need crating overnight/if left at the moment. 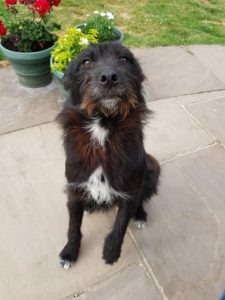 Paddy is housetrained and is OK to be left for a few hours in a crate, but no longer than this as he’s such a young dog who wants to be on the go. He would enjoy living with another dog to play with, but isn’t cat tested so cannot be rehomed with cats.